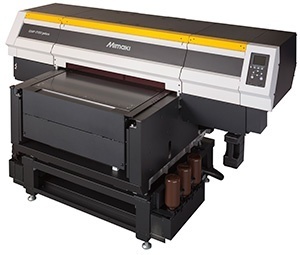 Mimaki Engineering Co., Ltd., a global industry leader and manufacturer of wide-format inkjet printers and cutting plotters, announced today that it will showcase the new flatbed UV inkjet printer “UJF-7151 plus” at the International Graphic Arts Show 2015 in Tokyo, Japan on September 11. The market launch will commence in November, 2015. The UJF-7151 plus delivers high quality printing while ensuring accurate ink droplet placement with the maximum printable size of 710 × 510 mm (28 × 20in). From the beginning, Mimaki has been a leader in the development of inkjet printers. In comparison to conventional analog printing, recently, there has been a growing demand for digital, on-demand, and plate-less inkjet printing because of its ability to quickly provide high-mix and low-volume printing. The UJF-7151 plus is the best digital on-demand printing solution for the screen printing industry. 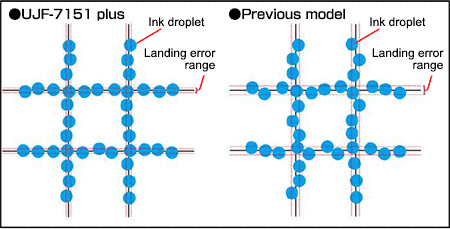 Accurate ink droplet placement is crucial for delivering high-quality printing. Thus, while ensuring accurate ink droplet placement, the UJF-7151 plus delivers high-quality printing. Moreover, the UJF-7151 is capable of printing onto Kiku-han* size which is often used at screen print factories in Japan. Furthermore, the UJF-7151 plus improves accuracy by modifying the mechanical structure of the print table and offers high-performance printing that meets the position accuracy necessary for additional printing on preprinted surfaces. Fine lines, edges, and small texts are clearly represented. In addition, double-layer printing, color printing on a white base layer. is possible. The patented MFD1 dithering technology processes image data along with retaining the original image quality. The highly improved quality-control MAPS4 reduces banding and uneven color printing, achieving top-level productivity within the same product range at a maximum printing speed of 3.3 m2/h*. The new printhead comprises a continuous ink circulation system to help prevent ink sedimentation and clogged nozzles. When nozzles are clogged, the nozzle check unit (NCU) automatically detects and cleans the clogged nozzles. Furthermore, the UJF-7151 flatbed UV printer employs a nozzle recovery system (NRS), ensuring that only good nozzles are used as substitutes if clogged nozzles are not recovered after cleaning. 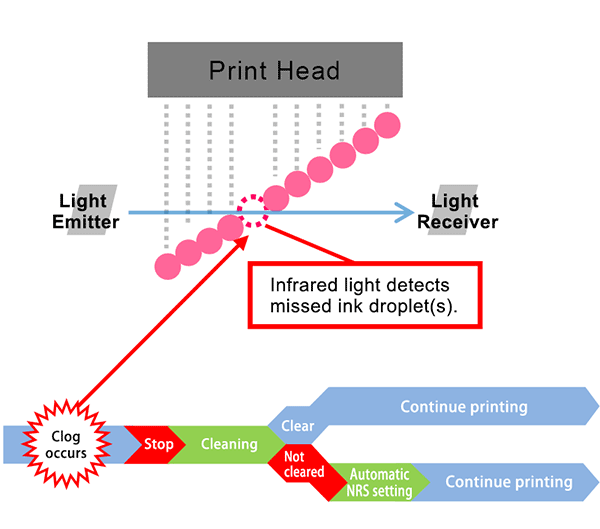 These functions maintain constant printing and reduce waste printing due to defective nozzles. The “UJF-7151 plus” is a “high performance UV Inkjet printer” that enables high-precision ink dot placement and beautiful printing through Mimaki’s proprietary technology and top-level productivity. ・Unlike conventional models, a print table moves during printing for reducing printer unit vibration. ・Two ball screws are installed on both sides of the table to facilitate its movement. ・Mimaki Advanced-pass system 4 (MAPS4) reduces banding and uneven color printing. 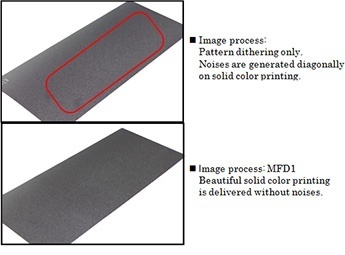 ・Mimaki Fine Diffusion 1 (MFD1), a patented dithering technique, is incorporated in the Mimaki RIP RasterLink 6 software. ・Maximum printing speed. By reaching approximately twice the speed of previous models, it achieves approximately 2.6 times the productivity of competing printers in its class. ・The print area expands to 710 × 510 mm (28 × 20 in), enabling printing of size 636 × 469 mm (25 × 18.5 in); which is often used for screen printing. ・Realizes high-stability printing through an ink-circulating mechanism within the head. ・”NCU” automatically detects missing jets for cleaning. When cleaning fails, “NRS” automatically sets a replacement nozzle and restarts printing. This minimizes the loss of raw materials due to missing jets and automatically continues production at high quality. The newly developed RasterLink 6 software,* incorporating the patented* image-processing MFD1, reduces noises due to dithering through hybrid processing of pattern- and error-diffusion dithering, thereby enhancing printing quality. * LUS-120 ink will be available in the future.